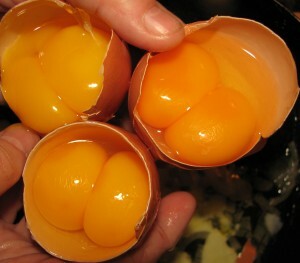 Two yolks in an egg – beating the statistics! First of all, let me take the opportunity to welcome you to the CCE blog as it seems to be me writing this very first blog! I recently learned that it is rare to have two yolks in an egg (see picture), though we would have seen this some time in our daily lives and just ignored. The probability of happening this is about 1 in 1000. This is even rarer when you break a number of eggs and continuously find these having two yolks. If we believe these statistics, one needs to break about 29000 eggs to find 29 double–yolked eggs, and the chances are extremely slim to find such double–yolked eggs in a row. There is recent news which can be read here or here with a title like ‘British woman cracks open 29 double–yolked eggs in a row’. She bought a tray of 30 eggs from Asda. Out of these 30 eggs, she found 29 of them (except the last one) having double–yolked, making a new world record after beating the previous best of six double–yolked eggs in a row. This merely seems to be a co–incidence beating the previous statistics, but also leave questions to think about such instances. These eggs would have been picked randomly among several others while packaging and these all happens to be the same type – an interesting instance for probability analysis and open discussions/comments!